You are here: Home » Money laundering the Labor Party and Union way. A few years back the NSW Labor Party stole over $700,000 of taxpayers money from two government departments which was laundered through the Transport Workers Union into Labor Party bank accounts. One of the key players, Tony Sheldon, was also caught in relation to a slush fund he had set up where a lot of the money is still unaccounted for. Sound familiar? Tony Sheldon is now the National Vice President of the Australian Labor Party as well as the National Secretary of the Transport Workers Union (TWU) not to mention one of the biggest thieves in the country. It is worth revisiting as it happened only a couple of years ago and the Labor Party claim the Health Services Union corruption was a one-off and the vast majority of unions are run honestly. This is also tied into a judicial corruption post I will do in the near future. cost of a discount to the workers’ pay rise” The workers got ripped off by Tony Sheldon to pay for this slush fund. 5. Tony Sheldon was meant to set up a “bipartisan board of union-employer people who would decide how the money should be spent for the benefit of TWU members” from the Industrial Rights and Training Fund. Sheldon never did set up the “bipartisan board” “despite wage agreements saying explicitly that this would happen.” It really shows what a thieving grub Tony Sheldon is. Not much changed. Two years later and things were still the same. On the 2nd of December 2011 Tony Sheldon started a three-year term as a Vice President of the Australian Labor Party. (There are two Vice Presidents) He is nothing more than a common criminal and should be facing charges along with his good mate Michael Williamson and everyone in the Labor Party knows this but they say nothing. How much of the above in relation to the slush fund has the same characteristics of the Julia Gillard / Bruce Wilson AWU fraud? Plenty! And like I said at the start there is a link in the above to judicial corruption which I will write about in a future post. A royal commission into the financial prudence of Australian unions would be most entertaining. Some think they got away with it. Some think they are above the law. Some of them even think that they run the show. It’s time for a thorough criminal investgation. Unions are killing themselves supporting these crooks. The piecemeal response is damaging the labor movement and ordinary worker. Their self serving frauds would not be tolerated in business. It’s time for a completely clean sweep, criminal justice, a set of standards and for all unions to replace all executives and present staff to ensure corrupt ties are cut forever. If my memory serves me right, i think Craig Thomson’s wife, Zoe, worked for the TWU as some sort of PR or Media person. It just gets more incestuous by the day. Bring on that Royal Commission. Clean out the rubbish. Forget the Royal Commission – it’s a waste of time and money! No Royal Commission would be allowed to get to the bottom of what’s going on in Australian politics..
What we need instead is for a group of HONEST people to dig into the dregs of corruption here in Australia – definitely not another corrupt quasi government body such as a Royal Commission! So, Phiston, just who is going to decide who the HONEST people might be? Re rh.. your response to my comment leaves me a little baffled. Nowhere have I suggested or even intimated that Shane Dowling stands by and does nothing or that does NOT do a good job. In fact quite the opposite is true. I am of the opinion that good, down to earth honest people – especially the ones who get off their backsides and actually do something (Shane and others like him for instance) – THESE are the people who will achieve more than any corrupt and dishonest Royal Commission ever could. Yes it does! but the media will not cover it…..WHY?…. the little people have a right and demand the media make this public! I hope to goodness they get something on this so called prime minister, I can’t believe we have these people running this country they are like the mafia, they only care about themselves they could’nt care less about this country, I do not know how they get away with it, can’t wait for question time, I hope Julie Bishop goes to town on her. It’s not a coincidence that our roads are clogged up with trucks. . at the expense of efficient rail transport of containers. Think about it, our health and wealth affected by the greed of a few union ‘reps’ who are even catapulted into political positions where they can turn a blind eye to continuing corruption in the unions/labour marriage. Gillard’s account of union slush fund rejected…A KEY former union accountant has undermined Julia Gillard’s depiction of a slush fund she helped set up in 1992 as being a legitimate association needed to help finance union election campaigns. Time to scrap the labour party and all within,a new one is needed with a different name. It is all to much,riddled with incestous greed. The more we learn about the goings-on of Union leaders, the more irrelevant they appear to be to the normal working person paying union fees from their wages. Tony Sheldon and others in top jobs were voted in democratically by the members. OMG SHANE, JUST WHEN I THOUGHT I WAS UNSHOCKABLE…. I HOPE ALL UNION MEMBERS REFUSE TO PAY THEIR FEE AND DEMAND A ROYAL COMMISSION. THE LEVEL OF UNION AND GOVERNMENT CORRUPTION IS CHILLING. I FIND IT CURIOUS THAT GILLARD HAS EXTENDED BRYCE’S TERM. You certainly are sweet and innocent if you think any union would let you get away with withholding your fees. You would at the very least be forced to quit your job for a start, and if not your life would be made such a misery you would be forced to quit anyway. AND TO THINK THESE UNION THUGS ARE RUNNING THE COUNTRY. If the matters referred to above have substance, then it is the duty of all who have information to support any aspect of them/it to report their information to appropriate authorities. In NSW the appropriate authority/s are the Premier, Mr. O’Farrell and the NSW attorney General, Mr. Smith. The allegations, if founded would appear to be designed stealing/embezzlement of public funds for private purposes. Premier, A G, Police Miniater, perhaps some inquiries are called for? Shane, Why am I not surprised, it sickened me at the time when these Union Leaders were having dinner with Julia at the Lodge, as you know of previous posts I have had my own experiences with the Unions and they are not pretty, but this just cannot go on. I just do not know what can be done, these investigations in HSU took so long that time runs out, but not enough people are making a noise, that is obvious. The Law of Mathematics will see this corruption ends one day! You can only bribe and burn so many people untill it backfires which is happening now. Nottwistedyet, this is not a easy battle as we have become reliant on the government to fix everything. You know what to do, so keep doing it! What possible hope do the vulnerable youth have in a very corrupted society? Thank You Shane Dowling for reporting the things that do matter.The only hope there is for balance and repair in a very beautiful nation. Shame on any that take the lazy ugly way in life and they know what it means to others . There is no ok in crime .There is no well they did it so it`s ok. It is putrid to do willingly with ill intent.It really harms many via that and shreds trust and good will and incentive to aim .Noone wants to support lies , that we know. At least the majority do know it is wrong and truth will triumph as it always has. Thank You again to Kangaroo Court of Australia. every-time i see this slippery character i get a cold feeling his favorite saying would be whats in it for me well Alan Joyce didn’t fall for his charm. don’t Gillard and Sheldon make a handsome couple. Alan Joyce called their bluff but it cost Qantas heaps even before he acted. I know because when I last flew Qantas their standards had dropped ! Less crew at the terminals where mums with kids had to line up without any help, food was below par and even in premium economy they only had 2 fish dishes, but advertised it as available in menu ! SHELDON AND GILLARD BIRDS OF A FEATHER YUK. Julia Gillard and this mob will go down in Australian history. (note the key word “down”). Julia Gillard is possibly THE most hated prime minister in our history. Julia Gillard is possibly THE most corrupt prime minister in our history. Julia Gillard’s government is possibly THE most hated government in our history. Julia Gillard’s government is possibly THE most corrupt government in our history. Julia Gillard’s government is possibly THE most financially inept government in our history. And with any luck, the first prime minister to be formally charged with criminal activity. They will go down in history for all the wrong reasons. Unfortunately, by the time all these corrupt labor officials are eventually charged ( if they ever do ) it will be too late. Wouldn’t put too much faith in the judiciary either. oh by the way… my understanding is that unions operate many “industry” super funds. true or not? if that’s the case, that is another huge cash cow for them to potentially rip off more money for slush funds and personal use. IMO we are better off putting our super into “business” based funds, not “union” based. this is another way to help strangle them. Yes, a good way to strangle them plus resigning from any suspect union! Regarding Super, again we trust the government, People should manage their own super! Well J Bishop, why not table the information here. Stuff al ban ooze/y and big bird. an afterthought to my comment yesterday: perhaps some person or people who have good research skills and understand the intricacies of unions/superannuation/fraud should look more closely into union controlled super funds. and i’d almost bet my house on it that there are rorts going on there too. there must be some kind of trail or loose ends that can be investigated. So who in politics would be game enough to raise the Superannuation / Union infiltration connection ? This is a very serious but touchy matter because any incorrect information could cause some hysteria in the marketplace. But I know that they have been doing lot’s of advertising in recent months for these ‘government super funds’ They don’t have fees, but do they have something worse ? Is there someone in the industry who has knowledge of any improper activity? There is a book written by Dr Des Moore, a former senior bureaucrat in federal treasury during the Hawke-Keating years, I cannot remember the book’s title but in it he outlined what he referred to as laundering taxpayer’s monies from government to unions to the ALP. The government made grants to various unions and they made donations to the ALP. Moore claimed that over 13 years close to $100 million was taken this way. I understand that state Labor governments have been involved too. Add the Centenary House affair, an ALP owned Canberra office building leased to the Audit Office during the Hawke-Keating years for 15 years with no rent review to market and a ratchet clause increasing the rental amount every year. The rent was much higher than market for Canberra and about what you would expect to pay in Manhattan, New York, USA. The ALP sold the building for a substantial profit. We taxpayers have been ripped off by the Labor movement for a very long time. We’ve got Michael Williamson made National President of the ALP, we had his daughter working in the Prime Ministers office(do a search, she recently “resigned”). We’ve got Eddie Obeid who was NSW Labor powerbroker doing “deals” on side and currently under investigation. The former NSW Labor Roads minister now under investigation for a hit and run in a car paid for a building developer. Craig Thomson who we know former union heavy and alleged to have been spending union members money like a drunken sailor. These all seem intertwined… a Labor/Union family of corruption and deals for mates running all the way from the bottom(except for ripped off union members) all the way to the top. This story has a long way to go, but where is the investigative journalism? You don’t have to be a chicago lawyer to work out, how corrupt this Union-Labor Government is, and it has been going on for decades at the expense of struggling workers by way of misappropriation taxes and Union fees, probably the biggest cons and scams ever perpetrated on Australian’s, the sad fact is you can never educate an idiot, and there is probably still 30% of all Australians who actually still think Union-Labor are doing a great job. We can only hope that the current ICAC NSW enquiry and other investigations,which appears to be gaining some momentum against this lot, will reveal the true Union-Labor Governments, State and Federal. 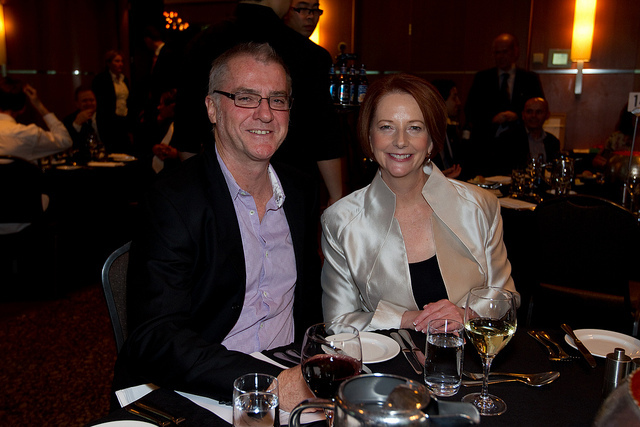 Yes David and Tony Sheldon has dinner with the Prime Minister at The Lodge. Disgraceful is using a nice word for it. Yes indeed, I know this story about Tony Shelden, one of the close friends of gillard. Unless we have this Royal Commission, we will never get rid of this corruption, which is more widespread than any of us can imagine, it is right through the union-movement, the labor party and the judiciary. What they are uncovering in NSW is only the top of the mountain! His predecessor and another ALP chief was firmly in charge at the time. His words “It’s not over” were probably meant to intimidate, yet, his opponents are champing at the bit to see him fall when those smelly ways are finally exposed and they are booted into touch for the last time. There is no probity in writing your own redundancy, members deserve better governance and administration, at least a leadership team that doesn’t conspire to rip them off.